Transport trucks equipped with platooning technology -- GPS and a wireless connection coupled with their own collision avoidance systems -- circle a track in close formation. BLAINVILLE, QUE. — Three Volvo transport trucks “platoon” in circles at the National Research Council (NRC) test track here, to take the critical next step toward a fully autonomous driving future. With systems that allow each vehicle to know what the other is doing, they can follow each other only metres apart and brake and accelerate as a pack. It’s as if they are physically connected. But well before autonomous vehicles actually arrive — perhaps in a decade — platooning could provide significant real-world-right-now benefits such as fewer collisions, improved traffic flow and reduced stress on operators. The big selling point now is an improvement in fuel efficiency when the vehicles tuck in closely to reduce aerodynamic drag, “the same way that motorsports racers and cyclists do,” says NRC Group Leader Brian McAuliffe. Look for these systems to come first in large commercial vehicles, those that could offer the biggest payoff in reduced operating costs and lowered greenhouse gas emissions. It is this benefit that lured trucking-company CEOs and government officials to Blainville for two weeks in late 2016. Volvo transport trucks and their 30,000-kilogram loads circled, lap after lap, separated by as little as a half second, which equates to 17.5 metres. Early findings suggest at least a six-per-cent fuel saving for a three-truck formation versus the same trucks running independently, says McAuliffe. At least seven per cent when the standard trailers are swapped for more aerodynamic units with side and rear fairings. Still-bigger gains are possible in winter when dense, cold air increases wind resistance. For an industry with millions of trucks burning an average 33.6 l/100 km, according to a 2012 U.S. report, the prospects are enticing. “Six per cent at a minimum is just phenomenal. Four or five per cent is fantastic [as a savings tar-get], and I think a lot of carriers would take that,” says Canadian Trucking Alliance spokesman Marco Beghetto. But a closed track, Beghetto says, is a long way from public highways, which is a point the researchers readily concede. The readout tells test driver Christian Deslieres when his truck is linked with others in the formation, and it alerts him when brakes are applied automatically when the lead truck shows. Can platooning offer any benefit over long-combination vehicles (LCVs) that drive with two full trailers in tandem, which are already allowed on many divided roadways? And how would weather and the actions of other road users — car drivers are notorious for their sudden cut-ins — affect platoon performance? Another question: Aren’t trucks already grouping up, despite the lack of any radar-based emergency braking systems? Many answers won’t come without real-world use, for which the trucks in this test are essentially ready. Already carrying Volvo’s collision-avoidance technology, they have been modified by the California Partners for Advanced Transportation Technology (PATT) program with global-positioning systems and dedicated short-range radios, plus layers of software to interpret the data being shared and apply it to the vehicle controls. Launched in 1986 at the University of California, Berkeley, PATT sent the trucks north for detailed fuel-economy testing in the NRC trial, especially in three-truck platoons. The testing also capitalized on NRC research into transport-trailer aerodynamics. Still needed are international standards for vehicle-to-vehicle messaging, legislation changes to allow close following and perhaps most important, public willingness to pass truck control from human to machine. Platooning advocates insist that drivers will be present and ready to take over if needed, but no one is sure how they can be kept attentive. “It’s hard for me to look in my crystal ball and provide a definitive answer on when the technology will come to market,” says Ryan Klomp, Transport Canada’s director of environmental and transportation programs. Some jurisdictions are already clearing the way for vehicle-to-vehicle communications. 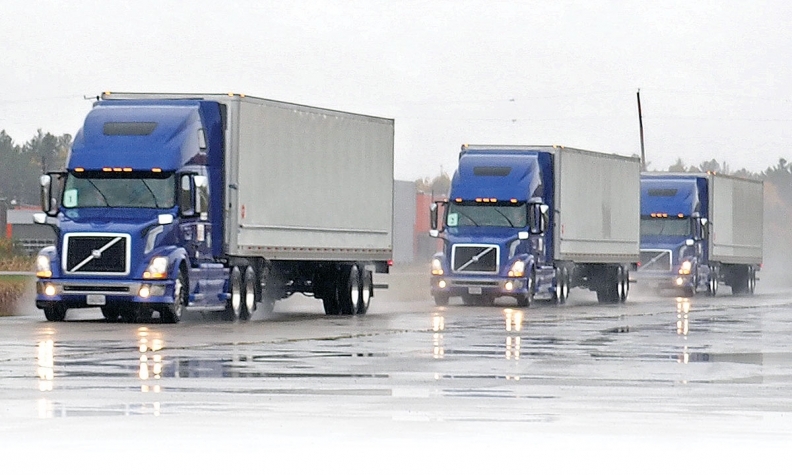 In December, the U.S. state of Michigan created an exception to minimum following distances to allow the closer following required for platooning. California’s Peloton Technology says 11 other states have approved trials. Peloton, with backing from Canada’s Magna International, had planned to begin supplying transponders in late 2016 that permit two-truck platoons. Whenever it arrives, at least some of the platooning technology will flow to cars. Klomp foresees the use of vehicle-to-vehicle radio and adaptive cruise control to prevent chain-reaction collisions.